Extreame Savings Item! 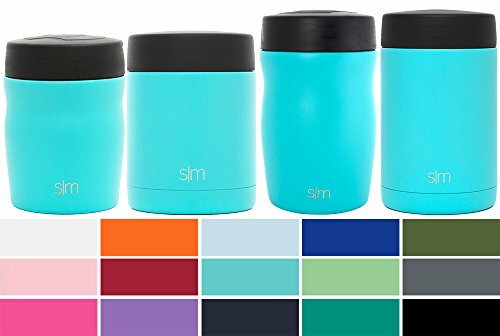 Save 49% on the Simple Modern Rover - 16oz Rover Food Jar - Vacuum Insulated Thermos 18/8 Stainless Steel Leak Proof Hydro Food Storage Container Flask - Caribbean by Simple Modern at My Athenas. MPN: RVR-16-CB. Hurry! Limited time offer. Offer valid only while supplies last. Put your tupperware, pyrex, bowls and ziplock bags away, our food containers will keep the contents warm up to 4 hours or cold up to 10 hours! Put your tupperware, pyrex, bowls and ziplock bags away, our food containers will keep the contents warm up to 4 hours or cold up to 10 hours! This food jar has a double-walled exterior with a vacuum between the walls. Your food in this container has no medium for the heat or cold to transfer through. Your food will truly stay as hot or cold as science allows. Even filled with ice or boiling water, the jar will never sweat or get hot to the touch! This food jar is made from premium gauge 18/8 stainless steel. Choose between the most popular powder coated colors. Powder coating is durable and gives the container a textured and vibrant finish. It is BPA free, lead free and FDA approved. It will never rust or leave a bad metal taste in your mouth. The exterior of the inner wall, in the vacuum sealed area, has been dipped in copper for added insulation. Copper reduces the transfer of temperature, adding even more insulation to your food jar. The mouth is extra wide so you can pour the contents into a bowl or eat directly from this container. The wide mouth makes cleaning easy, it will fit any cleaning brush or sponge. This portable food bowl will keep your food the same temperature as long as possible and the twist on double-wall insulated lid will prevent leaks. This is perfect for hot soup, stew, chili, ice cream and baby food/milk. Take hot or cold drinks with you to pour like coffee, tea or sports drinks. Use in your kid's lunch box, taking your lunch to work, camping, on road trips, sporting events and more. We would love to go with you as you make a positive impact and show the world who you are! VACUUM INSULATED - This purchase is for one Simple Modern food container that is double-walled and vacuum insulated. Put your tupperware, pyrex, bowls and ziplock bags away because our food containers will keep the contents cold up to 10 hours or warm up to 4 hours! This wide mouth reusable jar will never sweat or be hot to the touch. The lid is double-walled for complete insulation. POWDER COATED 18/8 STAINLESS STEEL - This food jar is made from premium gauge 18/8 stainless steel. We have chosen from the most popular colors, the powder coating is durable and gives the container a textured and vibrant finish. It is BPA free and FDA approved. It will never rust or leave a bad metal taste in your mouth. PREMIUM COPPER COATED INSULATION - The exterior of the inner wall, in the vacuum sealed area, has been dipped in copper for added insulation. Copper reduces the transfer of temperature, adding even more insulation to your food jar. MADE FOR EASY EATING AND CLEANING - The mouth is extra wide so you can pour the contents into a bowl or eat directly from this container. The wide mouth makes cleaning easy, it will fit any cleaning brush or sponge. TAKE IT WITH YOU - This portable food bowl will keep your food the same temperature for hours and the twist on double-wall insulated lid will prevent leaks. This is perfect for hot soup, stew, chili, ice cream and baby food/milk. Take hot or cold drinks with you to pour like coffee, tea or sports drinks. Use in your kid's lunch box, taking your lunch to work, camping, on road trips, sporting events and more. Take us with you as you make a positive impact and show the world who you are!